Munemasa Takahashi is a native and resident of Tokyo, but "SKYFISH" shows his desire to encounter the outdoors. 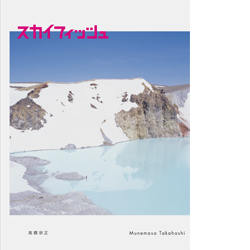 In a direct way, this work is about the experience of photographing nature, as we sometimes see Takahashi's camera-bearing friends exploring remote landscapes. In one case, a friend is lying down on his back under a waterfall, already completely drenched, but still pointing his camera up to the sky. It's an image that sums up the daring attitude to travel on display here. This book will certainly interest anyone who's wanted to experience the vastness of nature. Includes a biographical note in English.